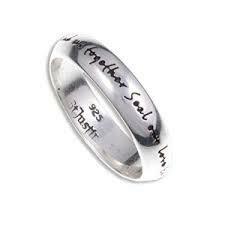 lovely inscripted sterling silver ring. We aim to keep availble sizes in stock, if out of stock please allow up to two or three weeks for delivery. Hello These rings are priced by size so I can only give a rough price about $1900 for both if you want to give us the sizes and caret we can get prices. Thank you Mary Walsh.